While registration numbers have been healthy for this weekend’s 2019 Queens Marathon, there is still room for youth (infants up to 16 years old ) to sign up for the Kids 1 Miler race. This group will run along the Marathoners for a short distance then circle back to complete their mile. The Kids of Queens is the Flagship Youth Program for the Queens Distance Runners. The Kids of Queens are able to enjoy free group runs and training sessions across the Borough of Queens. The program is close to home for Queens residents, and allows minimal commitment from families and excellent opportunities to network with the Queens Distance Runners. Parents and guardians are allowed to register and run with Kids. Along with strollers, they will start towards the end of the pack. Below is the link to register for this Sunday’s Kids of Queens 1 Mile Race. Also click here if you want to volunteer as well! Volunteers are still in demand folks. Pictured above are Kids of Queens runners from left, Roman Vazquez & Saul Vazquez who competed in last year’s inaugural Corona Mile at Flushing Meadows-Corona Park. The other day while I was in what would be considered the downtown section of Woodside, Queens, I noticed a Facebook post from a fellow Queens diehard and Woodside resident mentioning that long time neighborhood staple, the Cuckoo’s Nest Pub was shutting its doors. I thought their closing was worthy of an Instagram post due to the fact that they have been located at this slice of the neighborhood seemingly forever, nothing less, nothing more. While the popular comment to this post consisted of folks lamenting on losing the place, there were two people that had a very different perspective. Before we go into the details of the Instagram conversation I want to be clear that these opinions come from two men with a long relationship with Woodside. I respect them and hold them both in high esteem. This couldn’t be more true in this diverse borough of ours where everyone has a unique perspective. Bring your camera or even just your phone and share your visual perspective of a very underexposed section of Eastern Queens on Saturday, April 20th. Join myself, and Cody Herrmann of @FlushingBayandCreep for a photo walk covering the west coast of Flushing Creek located within the Willets Point section of Corona. The casual photography workshop will focus on documenting the area's rapidly changing landscape, and the relationship between Flushing Creek and quality of life in surrounding neighborhoods. This walk takes place in 'the valley of ashes,' as referenced in the novel 'The Great Gatsby,' and will trace City owned property through Willets Point, and under the Van Wyck Expressway. We will discuss water quality, local history, and plans for new development in Willets Point and downtown Flushing. We will also demystify parts of Willets Point and Flushing Creek. To spice it up a bit we will add a good natured photo competition for the best photos taken during our walking route. 1. Best capture of any “sign” that sums up the Flushing Creek area most accurately. We're seeking something iconic. This shot calls for creativity, and the only rules are that your photo best matches the vibe of this environment. 2. Best photo of the area’s revealing landscape. Whether focusing on wildlife or human industry, this shot should tell a story highlighting clues in the physical landscape of Willets Point and Flushing Creek that capture the often hidden ecological and/or political environments surrounding the area. 3. Best landscape shot of the Flushing Bay Beach shoreline. The photo emphasis here is capturing a clear depth of field angle of the man-made Flushing Bay Beach highlighting a balanced shore / creek ratio of the area. The tour will be held in partnership with @NYCH2O, whose mission is to inspire and educate New Yorkers of all ages to learn about, enjoy, and protect their city’s local water ecology. Portions of the walk will include sandy or uneven ground. Close-toed shoes are required. Event is FREE and open to everyone. Come join the Dominico-American Society of Queens (DASQ) to celebrate Dominican Heritage Month and the 175th year anniversary of the Domincan Republic’s Independence at the La Boom Nightclub located in Woodside, Queens. The Dominico-American Society of Queens is a community-based, 501©3 non-profit organization incorporated in 1993 to improve the quality of life in the Corona, Queens NY community. They are a member of the Hispanic Federation and UnidosUS. Originally founded to serve the needs of residents living in Queens county. DASQ has evolved over two decades to serve the needs of families located throughout New York City. It has since become a comprehensive and multi-service organization. Services provided are Adult Literacy and Job training, Legal and Immigration Services, Citizenship Classed and Youth Development as well as Referrals. DASQ serves thousands of individuals and families each year. Those served include recipients of public assistance, the unemployed and underemployed, disclocated workers, senior citizens, at-risk youth and school drop-outs, and the physically disabled. The DASQ 2019 Dominican Heritage Month Celebration will consist of live entertainment at one of New York City’s most exclusive Latin nightclubs, LA Boom, feature authentic Dominican food, face painting for children and a surprise gift for all adults! One things Queens does better than every other borough in New York City, is basketball. Or at least we used to. In the late 90’s and early 2000’s, the hoops talent flooding Queens high schools was insane. You had Queens kids like Lamar Odom from South Ozone Park, Chamique Holdsclaw from the Astoria Projects, Ron Artest from QB, and you also had Dorcas Carlo from Elmhurst. Yup, Dorcas Yasmin Carlo. While Dorcas ultimately didn’t reach the pros like the other names previously mentioned, she was one of the best female ballers in Queens when she played. She had the same dribble and handle that was definitive of all the elite guards that came out of this borough. Carlo was 4th in scoring in the the NYC PSAL League in 2004 and is STILL the All-Time Leading scorer at Robert F. Wagner Jr. High School. Needless to say it was great finally getting to meet Dorcas yesterday. We spoke about Queens, basketball and the plight of our hometown NY Knicks. Go to https://www.instagram.com to learn more about Dorcas in our #CapturedInQueens feature just out now. Early last month, I was contacted by Loycent Gordon, FDNY Fire Lieutenant and Owner of the oldest bar in New York City, Neir’s Tavern. In conjunction with Neir’s entering its 190th year of existence, Loy (as he is known to most) wanted to know if I was interested in being part of a new committee he was looking to form to help organize events and activities throughout the year to celebrate this special anniversary. The committee tabbed #Neirs190 was eventually created and today consists of various special local team members that are focused and dedicated to preserving and protecting the oldest tavern in Queens. Neirs Tavern opened officially in 1828, has not only always been a cultural institution in Woodhaven, it is also a community safe haven. The latter can be primarily contributed to Loy, and the last 10 years he has been the owner. Loy cares supremely about upholding Woodhaven culture, the history of Neir’s and most importantly the people of Woodhaven. If you have ever been lucky enough to experience one of Loy’s “Nickel tours” you know exactly what I mean. Needless to say, I immediately jumped at the opportunity to be involved. As a #Neirs190 Ambassador our task at Queenscapes will be a social media geared focus on promoting Neir’s Tavern’s upcoming celebrations, highlighting past events and most importantly spreading the word through the various Queens communities of Neir’s significance in Woodhaven. We will highlight all the amazing community events that have happened over the years at Neirs, across all our social need networks and promote all new events geared for #Neirs190 as best as we can. So stay tuned folks and we hope to see you at Neirs soon. 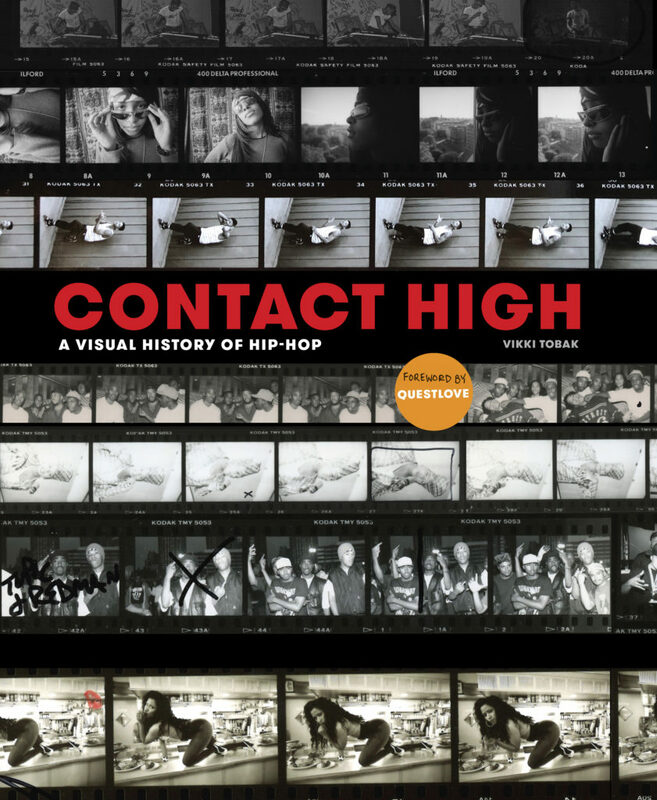 Folks, come out to to Book Culture LIC Wednesday, January 23rd 2019 at 6:30pm, as author Vikki Tobak discusses her book “Contact High” for an event presented by Back to the Lab NYC. Back to the Lab NYC is a community organization for photogrpahers seeking to hone their skills and craft their vision. The org was founded by Huguette Ampudia, Mark Beckenbach, Marco Jokic and Salvador Espinoza. Contact High is an inside look at the work of hip-hop photographers told through their most intimate diaries—their contact sheets. Vikki Tobak is a journalist whose writing has appeared in The FADER, Complex, Mass Appeal, Paper Magazine, i-D Magazine, The Detroit News, Vibe, and many others. She is a former producer and columnist for CBS Marketwatch, CNN, Bloomberg News, TechTV and other leading media organizations. Vikki is also the founding curator of FotoDC's film program, and served as the art commissioner/curator for the Palo Alto Public Art Commission in Silicon Valley. She has lectured about music photography at American University, VOLTA New York, Photoville, the Library of Congress and the Museum of Contemporary Art Detroit. Purchase your book at Book Culture LIC and mention Back To The Lab for 10% off your purchase, and support a local business. I vaguely remember what the Falchi Building used to look like in the 1990’s. Besides the old Avirex jacket factory that used to sit prominently in the front of the entrance, the building itself pretty much looks the same as it always has. It’s when you add the Citi Bike docking station firmly affixed to the curb along the corner of 47th Avenue, off of 31st Street, along with the 4-5 food carts that call this street home from 9:00am – 5:00pm each day, where you start to really feel the difference. The buzz on the block is like a scene out of afternoon at Penn Station. Like most of Long Island City, change has come here, and it has come fast. In 2019, I’ll try to do a better job at remembering the way the rest of old Long Island City looks right now. “Back in 1969, myself (Lisa Gowdey) Cassandra Draft and a few of us from the neighborhood formed a community organization to clean up that section of Farmers Blvd. It was a triangle where all the winos hung out and an eyesore. We all lived on Farmers or surrounding roads. I lived on 111th Rd, Cassie lived off Murdock, and many others. We got the local precinct to help with traffic and we cleaned the street from Linden to Liberty. We picked up trash, glass and everything. When we got to the Triangle, it was full of wine bottles, trash, and a bench. That rock was a WWII memorial with a plaque on it. We decided to paint it with the cooperation of the local A&P behind it and the drug store across the street. We painted it red, black and green for the neighborhood and left the plaque untouched. The City of NY was very upset and ordered us to sandblast the paint and restore it to its original state. With the help of the local store owners backing us, we defied and challenged the city. They agreed to leave the paint but removed the plaque to another place. So THE ROCK became a focal point of pride for the neighborhood. We had bake sales there which is how I met my husband who had just returned from Vietnam. I came across Brother Maars’ work on Instagram casually, from the explore page I believe. Immediately I was taken by not only his vibrant and colorful artwork, but also by the commentary that accompanied his images. Words of a man being pushed to the brink, but not over. Silver linings around each corner, words from an eternal optimist. Maars’ work is heavily influenced by hip hop and his upbringing as an African American in this country. With his over the top images of sexuality, social commentary, and his firm grasp on pop culture themes, I felt Maars’ paintings really spoke to me and to folks who grew up in my generation. 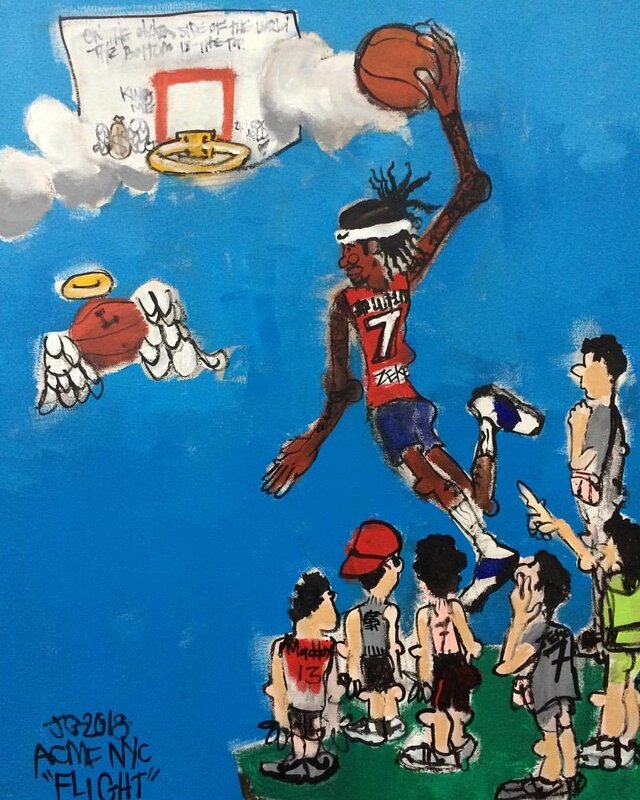 We are honored to announce that Jamar, the Brother Maars has offered one of his original paintings to be raffled this Saturday night for our culminating pop-up photo exhibit at Neirs Tavern in Woodside for our #QUCaresDrive18 charity event. To view Maars work go to https://brothermaars.tumblr.com/ right now. While today is officially Halloween, a day widely recognized as a lighthearted fun holiday, it is also the The Day of the Dead, or as it is known to Mexicans, Dia de los Muertos. Dia de los Muertos is a Mexican holiday celebrated primarily throughout Mexico. The multi-day celebration starts today October 31st and runs until November 2nd. It focuses on gatherings of family and friends to pray for and remember friends and family members who have died, and help support their spiritual journey. Yesterday I ventured out to Jackson Heights/Corona, where the heart of the Mexican community is located, to see if I could get more information on Dia de los Muertos celebrations happening locally in Queens. I was lucky to run into Senora Mary, (pictured above), pronounced Ma-rie on the corner of 89th Street & Roosevelt Ave in Jackson Heights. Senora Mary is a local street vendor from Puebla, Mexico who specializes in soul cleanses, spiritual cures for internal diseases, “mal de ojo” and Tarot card readings. 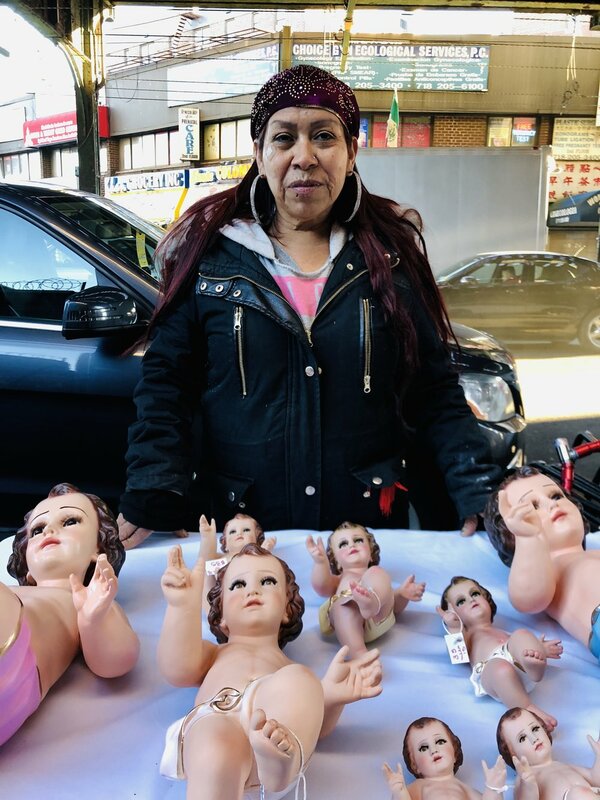 Along with the myriad of services above, Senora Mary also has a wealth of religious items for sale on her three tables conveniently tucked under the 90th Street – Elmhurst 7 Line station. Due to the upcoming Dia de los Muertos holiday there was some extra special items on display. The first item that piqued my interest was the steel chain and Santisima Muerte pendant. On one side of the pendant, it featured a skeletal figure covered in a glowing bright purple robe. On the other side is a prayer for the Santisima Muerte. As described to me by Senora Mary, the Santisima Muerte, or Santa Muerte is a female saint and central figure in the commemoration of Dia de los Muertos. Santa Muerte is affiliated with a wide range of powers, including love, good health, fortune and healing. The other item(s) that I was intrigued by was the full table of porcelain baby Jesus dolls. The babies came in various sizes, each one white, each one unclothed. It was explained to me that the babies symbolize the birth of Jesus, and while that event represents December 24th, it holds true on days like today, where life is celebrated. So while I didn’t find the event I was searching for, I found Senora Mary, and her small slice of Jackson Heights. I left her sanctuary with a nose and chest full of incienso de iglesia, (church incense) with some really good vibes and a better understanding of a commonly misunderstood holiday. While I try to be as diverse and all-encompassing of all the neighborhoods and stories of Queens on the Queenscapes Instagram page, I am always also looking for that IG page that is doing photographically something different and concentrated to one of the many layers of the Queens landscape. The gem of a page, @allthequeenshouses fits that bill perfectly. But I cannot take credit for finding Rafael Herrin-Ferri’s Instagram page, @allthequeenshouses. For that I have to thank friend and architectural photographer Ines Leong who introduced us around a month ago. Rafael, an architect himself, has been conducting a photographic survey of the housing landscape in Queens since 2012. From Multi-Family Open-Bay Facades in Queensboro Hill to the Detached Dormer Sliding Down Porch Roof Dwellings that occupy College Point, Rafael has covered a large part of Queens, to date over 5,000 photographs worth of Queens territory. Finally got the opportunity to meet Rafael last night in Sunnyside, his hometown the last 15 years. We spoke about the motivation behind his project, the struggles of cultural indifference in Queens and even our own families. I thought it was interesting that Rafael mentioned to me that he only photographs landscapes on overcast days, which as most photographers can attest to, offer the best exposure to extract the detail from your subject. I look forward to working with Rafael soon, but in the meantime while we figure things out, please go follow https://www.instagram.com/allthequeenshouses/. You’ll thank me later. A couple weeks ago I was notified by Kenny Medrano, Director of Finance, Community Organizing, and Participatory Budgeting in New York City Council’s District 26 that I was selected to receive an award from Queens Councilmember Jimmy Van Bramer for my community work with Queenscapes. The recognition, while I was immediately extremely grateful for it, really shocked me. The idea of being honored for something I genuinely enjoy doing and have a real passion for, is still settling in. My first question to Kenny, after the shock & awe subsided was, “What do you need from me?” I figured his request was simple enough, “Send me a bio.” So I sent out the standard 3 line copy that I have been circulating all year. Being a proud product of a Dominican mother and Puerto Rican father, provided the ideal foundation for Adolfo Steve Vazquez to flourish in a multicultural Queens. Vazquez’s love for Queens started with his adoration for the hometown New York Mets. His loyalty and appreciation to the borough only strengthened as he moved multiple times as a kid, South Ozone Park, Richmond Hill, Astoria Houses, then Saint Albans. Upon graduating Long Island City High School, he found a passion for writing. He left L.I.C.H.S as the Editor-In-Chief of their school newspaper “The Skyline” with the intention of creating his own Queens based gazette. However it wasn’t until 2014, after marriage and children, and understanding the value of raising a family in today’s Queens, that he finally thought of an idea that made sense. The Queenscapes project was a personal venture he created as a means to fully discover his hometown with his two young sons, Roman and Saul. The objective was simple, travel to each and every neighborhood and sub-neighborhood in Queens and document what he learned onto the social media app, Instagram. Very quickly the project caught on, and became popular to not only Queens residents but also with people who grew up here and/or had appreciation for the World’s Borough. Without prompting, the community rallied around the idea of Queenscapes, and birthed a bunch of Queens based grassroots movements. Today, Queenscapes is a full fledged community organization that looks to shine a light on the undiscovered and underappreciated areas of Queens through photography. Since late 2015, Queenscapes has either created or collaborated on over 30+ events all over Queens. 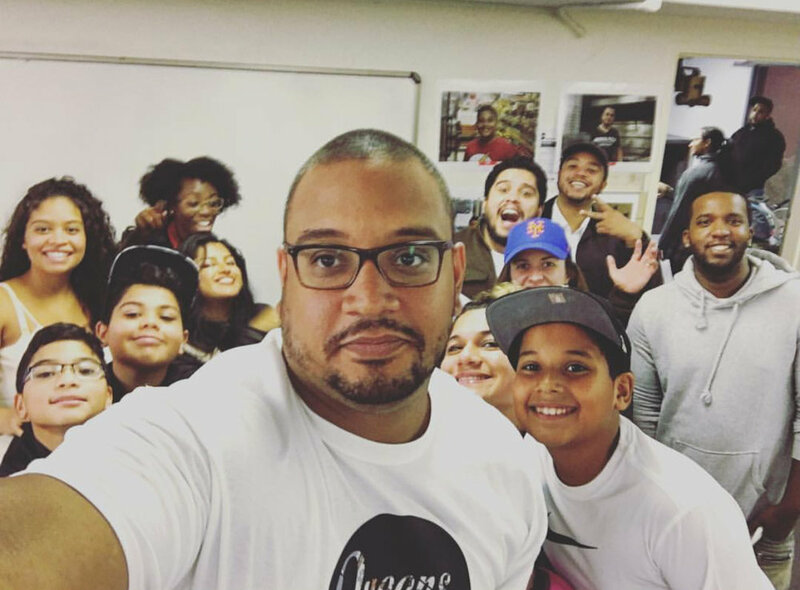 With his community collaborative exhibits he gives a chance to every Queens resident or visitor with a camera phone and a unique perspective, to be represented. This past November their #QU4PR benefit helped raised over $2,300 for Hurricane Maria relief victims in Puerto Rico. To RSVP for event on Monday night on October 15th 2018, please e-mail us at queenscapes@gmail.com or send us a DM with your full name on our Queenscapes Instagram page. P.S. 36, The St. Albans School is located at 187-01 Foch Boulevard St. Albans, NY. This District #29 public school provides education to grades K-5. The building itself was erected in 1924 and was the first public school in an area that is home to one of New York City’s oldest and most established American neighborhoods. P.S. 36’s demographics are also representative of the area with African American students representing almost 90 percent of the population. As per a school quality snapshot provided by the NYC Department of Education only 18% of it’s students met the state standards on the state math test. Amongst other things, P.S. 36 suffers from a lack of educational resources and a widening student/teacher ratio. It fits the the profile of the performance of New York City public schools based in economically disadvantaged areas. Over 70 percent of the student body come from economically disadvantaged background. So while Saint Albans has a very rich history and primarily proud African American (and burgeoning West Indian and Caribbean) culture, it’s current infrastructure doesn’t support its children, the future of Saint Albans. The area’s schools don’t give them the best chance to come back home as adults as accomplished and proud Saint Albans natives. Ironically, this school, P.S. 36, is the same place I voted for the African American presidential candidate Barack Obama on Tuesday November 4th 2008. I voted for Obama, along with many of my neighbors in Saint Albans, at the time, to make a difference in our neighborhoods with the hope that the kids from this school, would be able to be have a chance to be as hopeful for their future as the kids are from the other side of town. Today I posted the 2,000th photo on the Queenscapes Instagram page. If you have been following Queenscapes since the hashtag started back in 2014, you may or may not have realized that the idea came about as a way for me to connect intimately with my two young sons, Roman and Saul, then ages 9 & 8 respectively, while we discovered our hometown. The objective was to explore every neighborhood with both of them and to learn as much as we could, and share our findings on social media each day. In the very beginning, we did just that. While they were possibly too young to be aware of exactly what I was trying to accomplish, I made sure we had fun while we did it. Eventually, Queenscapes gained some media attention, and helped me earn a bunch of freelance gigs. Within a year, it became more than that, and with a lot of help from the Queens community, we were able to pull off some really amazing events in Queens, real community building endeavors. Before I knew it though, the fun I was having in the beginning with my two sons and this passion project turned into work. Work turned into deadlines that turned into increasing pressure of completing tasks. Today I deal with the stresses of stalled commitments. More importantly though, I have done less exploring with my sons. One of those sons, is the boy pictured above, Roman Stephen Vazquez, now age 13. So, I while I’ve used numerous posts lately to mark certain milestones and reflect on how far Queenscapes has come, today I remember my first photos uploaded on Instagram, the first photos I took with my boys as we explored Queens. For a long time, I firmly held the belief that my vote, or anyone’s single vote doesn’t really make a difference in who ultimately gets elected to office in this country. I applied this logic as the basis for not voting for many years. I used this logic as a rationale that made me feel better for not only voting, but also for not get involved in politics at all. While I think the integrity of the popular vote is still something that should be challenged, I’ve learned expressly through the recent climate of this country, that there definitely is a greater need for us all to be informed on political matters and the policies currently in place. In the effort of searching this information, you never know… you might even allow yourself to be inspired. Still not as versed as I would like to be, I am inspired by Jessica Ramos and the campaign she is running for the State Senate’s 13th district. Ramos is a progressive Democrat born and raised in Queens from immigrant parents, and is focusing on fighting for working families, advocating for labor and organizing her local community. These are some of the reasons why she gets my vote today. There are also a bunch of other offices to be decided on before today’s end, most notably the Governor of New York state. So, If you have yet to decide whether to vote or not, at least think about reading up on the folks that will potentially make a huge difference in how you live. You may surprise yourself and get inspired. 30,000 hashtags, wow. That’s 30K in Instagram language, and while I’ve seen a bunch of hashtags explode way past the 100K mark in the same 4 ½ years since I started #Queenscapes, I’m still proud at how far it has come. While the follower count on IG has leveled off, the growth of the #Queenscapes hashtag has been consistently growing throughout the years, and today, it is basically double the amount of our total follower count on Instagram. Lately though, with the ease of purchasing followers and the lack of integrity in which some folks use their accounts, your follower count doesn’t measure your engagement to your audience as accurately as the use of an universal hashtag. A hashtag in our case that is not the easiest to spell out, not the shortest one to type. #Queenscapes with one “s”, not two. Today, I thank everyone who has every used the #Queenscapes hashtag past, present and future. Because of you I have kept on, because of you I know the Queens community still needs this Instagram page. Last Thursday morning I received an email by Kevin Montalvo Founder of Queens Distance Runners (QDR) to notify me that on behalf of QDR, he wanted to honor me at their Inaugural Corona Mile as a “Community Champion” for leading the way in the work we have done in Corona and Queens abroad. Paired with the fact that I have been wanting to participate in a QDR event for the longest time and looking for opportunities that allow me to prove that Queenscapes practices what we preach as a community organization that promotes healthy lifestyle initiatives, this was a no-brainer for me to accept. So I agreed be a part of the race, and was excited for the chance to actually run with the folks of the world’s greatest borough for the first official race I have ever run. Also, I figured it’s only a one mile race, how difficult could it really be? Even though, saying that I’m a little out of shape is a huge understatement, even I had to be able to pull this off. Plus I had a little extra motivation as I had my colleagues and close friends, Ashley Dean, the Founder of the Queens Hip Hop Festival and Ruben Ramales, Managing Director of American Institute of Architects of Queens also selected as Community Champions of the Corona Mile as my racemates. To make things more interesting I made it a family affair by enlisting my sons Roman and Saul to join along with me. The night before race day, I realized that the weather for the Corona Mile was not going to be agreeable. With thunderstorms predicted all morning, it wasn’t just getting wet that worried me, but also the safety of my two young children. 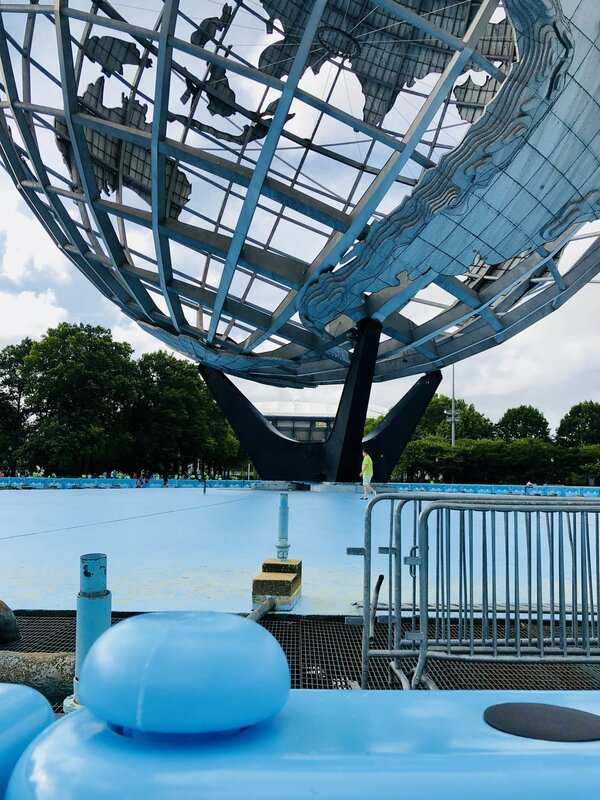 We played it by ear the next morning, and right after a real lengthy downpour, and a break in the rain, we rushed over to the Unisphere to be ready for the start of the race. Unfortunately, we did not beat the worse of the rain, and the prospect of the piece of cake run I envisioned this to be, was washed away in the deluge that ensued. But we ran anyway with a bunch of other dedicated and brave runners, through the thunder and lightning and completed what we set out to accomplish, together.